A local indie band, The Pieces, are bidding to become the next big thing after a promising start to their music careers. The members of The Pieces are David Bardon, Kayd Kalali, Ruben Kenton-Harris,, Will Barrett and Louis Gilbert and they gave a great performance at a recent W4 Youth event to raise awareness of the charity at High Road House on Chiswick High Road. The group are all members of W4 Youth, run by Sally Chacatté. W4 Youth runs a number of clubs including street dance, drama and football and brings young people together at St Peter’s Church Hall every Friday night for a more traditional youth club. The band was formed in 2010 and they won a Battle of the Bands competition run by Helen Martin at The Watermans Centre, Brentford and have performed many gigs including The Half Moon Pub and played at the Bedford Park Festival on Sunday. 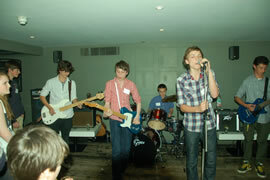 Their influences include some classic bands like The Beatles, The Rolling Stones, and The Jam as well as some modern bands, such as The Kooks, The Arctic Monkeys and Razorlight. They were in agreement that winning at Watermans was what made them start taking it seriously. Kayd said: “We take school seriously but we want to be in music. We spend our spare time rehearsing. The band unanimously agreed that forming The Pieces has given them more confidence and were very grateful to W4 Youth for the support they are giving them.